Bioclear is a highly effective, highly esthetic way to close gaps and black triangles between teeth and improve tooth shape. And it’s done without braces or porcelain veneers. Dr. Stephen Doan of La Jolla is an accredited cosmetic dentist and one of the few certified Bioclear providers in the San Diego area. He uses this treatment to provide a better way to a better smile. Bioclear is an advanced, minimally invasive cosmetic dental treatment that uses heated flowable composite to enhance the appearance of your teeth. 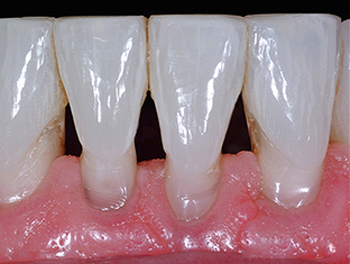 Heating the composite helps it cure—or set—deeper, harder, and faster than traditional dental bonding to increase the durability of the restoration. And unlike porcelain veneers that cover only the front of teeth or composite bonding that is applied to specific areas of a tooth, Bioclear covers the entire tooth. Before Bioclear treatment begins, Dr. Doan will ensure you’re a candidate for it. 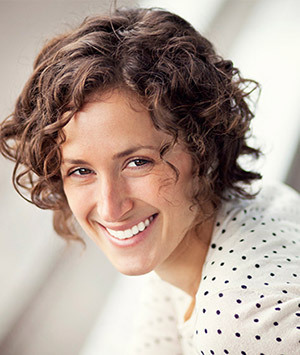 During a consultation with Dr. Doan, you’ll discuss how you want to improve your smile. Dr. Doan will examine your teeth and gums to ensure they are healthy and free of decay or disease. A rubber dam will be used to protect your gums during the procedure. Dr. Doan will remove any plaque from your teeth. A clear matrix, or mold, is placed around each tooth that is to be treated. Dr. Doan will trim the matrix into the desired shape for your tooth. The top edge of the matrix fits between your tooth and gums to ensure it stays in place during treatment. 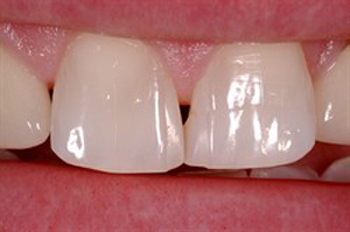 An etching gel is injected between each matrix and tooth. The gel will gently etch your teeth so the composite will adhere to them. After your teeth are rinsed and dried, adhesive will be applied. Dr. Doan will first inject heated flowable composite between each matrix and tooth and then add heated regular composite to it. 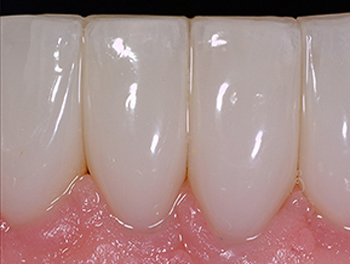 The composite in the matrix flows around the tooth and will be sculpted to match the desired tooth shape and size. After removing the matrices, Dr. Doan will polish the composite to ensure your teeth have natural-looking luster and gloss. Most porcelain veneers require preparation—or the removal a small amount of the front surface of the tooth. Bioclear involves little to no removal. While a porcelain veneer is only bonded to the front of your tooth, Bioclear covers and strengthens the entire tooth. Matrices ensure the composite is precisely placed to avoid irritation to your gumline, which sometimes occurs with veneers. Bioclear is faster and less expensive than receiving veneers. The Bioclear process surrounds teeth with warm composite for a stronger restoration than bonding, which is only applied to specific areas of a tooth. It’s more stain resistant than traditional dental bonding. Bioclear matrices provide greater precision for tooth position, size, and shape. The photos below show how beautifully Bioclear restores peg laterals and teeth with gaps or black triangles between them. As an accredited cosmetic dentist, Dr. Doan is an artist. 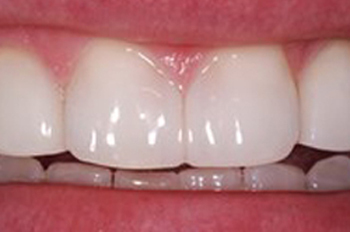 He applies his artistic talent to the Bioclear technique to produce predictable, beautiful results. If you’re interested in discussing how he can use this technique to enhance your smile, contact us to request a consultation. Call us or complete our Request an Appointment form. Your Doan-crafted smile makeover will not only be beautiful, but will be so natural that no one will know you weren't born with it. Dr. Stephen Doan will make you start every day with a beautiful smile.